Universal Soldier: Day of Reckoning - presented in 3D - is the fourth film in the Uni-Sol franchise. Sixth if you count the two made-for-Showtime sequels. But it's not the typical law of diminishing returns with the series. They've had missteps. 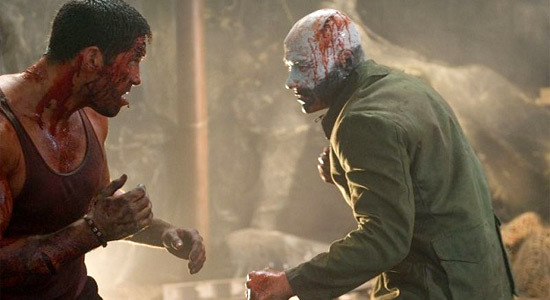 Bill Goldberg is hardly ever a good choice, but in the hands of filmmaker John Hyams, 2009's Universal Soldier: Regeneration was a badass action movie of higher quality than anyone expected. His newest, Day of Reckoning, still has the hard-hitting action that makes these films entertaining, but the shitstorm of a screenplay keeps you praying for the next head to explode. This script issue isn't a shock, really. Regeneration, for all of its over-the-top stunt work and elaborate set pieces, had a decent script but nothing all that memorable. It was a forgettable enough movie that when Day of Reckoning begins, and our hero is Scott Adkins instead of Jean-Claude Van Damme, one has to rack their brain to remember how the previous film ended and if any of the narrative gaps are only there because of a fading memory. They aren't. Hyams handled screenplay duties on Day of Reckoning along with a team of writers, the "too many cooks in the kitchen" analogy rearing its ugly head once again. It's a film that can be described as choppy at best, convoluted and utterly confusing at its worst of times. Adkins plays John, a man whose wife and daughter are brutally murdered in front of him by Jean-Claude Van Damme's Luc Deveraux - the original Universal Soldier returns here as the villain. After recovering from his own injuries, John must hunt down the man who killed his family and hand out the most brutal of vengeances. Seems simple enough. And it would be a simple enough movie if Hyams and crew didn't feel a necessity to make a grand statement here. The involvement of a mysterious government agent adds little to the film's impact even though it strives to say something about the Universal Soldier program as a whole. Deveraux leads a group of jacked up soldier types, probably clones from the days of the program, but it's never quite explained. There are half-realized moments of exposition about the last, few years in Deveraux's life, seemingly nothing of Regeneration coming back around to lend a hand in logic gaps. You could bone up for the new one by watching Hyams' previous film in the series, but it would only confuse you more. Thankfully, the screenplay, though oddly structured as an investigation piece with John searching for Deveraux, allows for ample moments of fine action in creative locations. Hyams hasn't lost a touch in that department these last, few years, and Universal Soldier: Day of Reckoning ends up making up for its script issues by catapulting us into banging action after banging action. Yes, the down-time between lags, and the time feels heavy at times. Adkins, though a decent actor and damn good stuntman, does all he can with the drama written for him. Sometimes it works. Other times not so much. The star isn't anything like Van Damme or Dolph Lundgren, who also returns for inexplicable reasons. His character, that is. You eagerly wait for the moments when either stars of the original film are back on the screen, developing a mythology to the whole series even if it isn't up to first-film standards. Both Van Damme's Deveraux and Lundgren's Andrew Scott are interesting characters, made all the more intriguing by the fine work each actor gives them. Day of Reckoning doesn't give us enough of either, each actor seemingly have two or three days on set. But you wait for their moments, and they do come. The movie kicks in some interest when they do. Former UFC star Andrei Arlovski also returns as another "soldier", and he and Adkins have a remarkable hand-to-hand fight, which is preceded by a quality chase sequence for a film without a $100+ million budget. That's what John Hyams does well. He invents creative action sequences and follows through on the swing when it comes time to execute. The punches feel hard. The shotgun blasts feel meteoric. Universal Soldier: Day of Reckoning is just the latest example of how the director can achieve action that almost makes one forget if the film is actually any good or not. Getting his hands on the right script is the first step in making an action film that's truly remarkable. This isn't it. But hey, at least it doesn't have Goldberg. You sir clearly do not know about reviewing films. A 4.5 are you serious I would have rated this film higher. More of the problem is in you poking holes in the script and challenging the lack of continuity when the series had barely any to begin with. What's wrong with Scott Adkins character being the new focus he's a great dedicated actor much like Van-Damme & Lundgren, surprisingly they all started in Expendables 2 no quote about that film? The least I would have gave this film would be a 6.0, I've been around in the film industry to say and the process of films such like this is a long method of work. Please next time consider the many people who put there time into works of art such as this. Oh come on, he can give the film any rating/review he wants. He's a critic. Jeremy is more of a critic than I am, it's his job to be honest, provide critiques, and state his opinion, whatever it may be. There's nothing wrong with any of that. However, what IS wrong, is you claiming "you sir clearly do not know about reviewing films" just because he gave this a 4.5. I Present Dolph Lundgren, Rhodes Scholar. Seriously he is bright.